GB: Tell us a bit about yourself and your role during the development of Baldur's Gate II. James: I'm James Ohlen, Director of Design at Bioware and Co-Lead Designer on Baldur's Gate II: Shadows of Amn and Lead Designer on Baldur's Gate. Kevin: My name is Kevin Martens, and I was the Co-Lead Designer of Baldur's Gate II: Shadows of Amn and the Lead Designer of Baldur's Gate II: Throne of Bhaal. GB: What was it like to be a part of the Baldur's Gate II development team and how have things changed at BioWare since then? Any fond memories you can share with us? James: I have two primary memories burned into my mind from the Baldur's Gate days. The first memory is the horror of crunch time. Shadows of Amn was an enormous game with so many plots, characters, items, spells, places, etc., that it took a lot of work and passion to get that beast out the door. That leads to the second memory: creative fulfillment. I think the stars aligned for Baldur's Gate II in a way that they probably won't again. We had a finished engine that allowed us to focus on content rather than basic functionality. We had enough staff familiar with the engine that we could iterate content very quickly. We shipped it at a good time, shortly before the Christmas shopping season. Our system requirements were low, and a lot of basic machines could run it when they couldn't run the latest 3D marvel. It was a good environment for getting content into a game, as the result has shown. GB: Which RPGs would you list as your all-time favorites and how did such titles influence or inspire you during the creation of Baldur's Gate II? Kevin: Personally, Ultima IV, Fallout, Bard's Tale, and a number of the earlier AD&D games like Dark Sun: Wake of the Ravager or Eye of the Beholder. 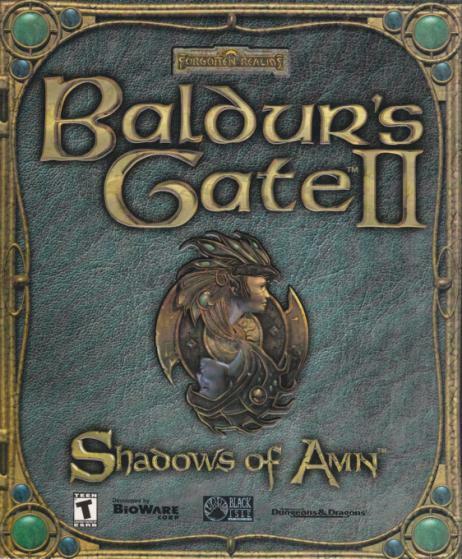 All of these games had things to teach us, such as Ultima IV's moral system and world exploration or some of the very clever GUI and interface changes of the two Dark Sun games, but I still think the biggest influences on the Baldur's Gate series are the pen-and-paper games that we all played as kids. Everything we learned as Dungeon Masters for our friends when we were young made us good designers for Baldur's Gate. GB: What specific aspects of Baldur's Gate II do you feel attributed to the game's major success? Kevin: Well first off, it was enormous. We could guarantee that we had something for everyone simply by the amount of content, which also contributed to the replay value. I started at BioWare only a few months before Baldur's Gate hit shelves, so I wasn't involved with the core design of the series or the engine. I would like to take this opportunity to toot BioWare's horn without tooting my own. The real-time pause combat system on top of the deep roleplaying game is one of the best things that has ever happened to the RPG genre. That extra element of tactics from the realm of games like Warcraft II or Starcraft really opened up the combat experience of the game, and I think it also drew some of the really cool elements out of the AD&D system while keeping combat fierce and action-packed. Any success I've had with the engine since then I owe to the core concept pioneered by the Baldur's Gate team. It wasn't just clever innovation and size that made the game a success. At the end of the day, Baldur's Gate II did well because people worked so hard, for so long, with so much passion, and refused to let the game out the door without those extra little pieces that make the experience so memorable. I am forever indebted to the Baldur's Gate series teams for making my career and allowing me to live a dream. GB: How have BG2's innovations (NPC interactions, character customization, etc.) influenced RPGs as a whole and BioWare's current and future titles? James: I can't speak for other developers. Hopefully they enjoyed the game and weren't too hard on us if we screwed something up. Like any of our games, Baldur's Gate 2 has influenced the design of every game that we've done since. Specifically, BG 2 has had a huge influence over the design of Dragon Age, a new PC RPG that we are currently working on. GB: Given today's sales-oriented RPG market, do you think a game like Baldur's Gate II with 200+ hours of gameplay is still feasible? Why or why not? James: I'd like to echo my answer from the fond memories question above: It's possible, but it requires a healthy mix of luck and a ludicrous amount of work. The work can be done; the luck is out of our hands. GB: Why do you think the Infinity Engine worked so well for Baldur's Gate II (and four other highly successful RPGs), yet many RPG developers are straying away from a party-based isometric style regardless of the engine's success? James: The Infinity Engine was a great engine for the Baldur's Gate Series, and we look back on it fondly. It managed to more or less bypass the issue of 3D graphics altogether (other than limited exceptions like 3D spell effects, for example) in favor of beautiful hand-painted backgrounds. When the first Infinity Engine game came out in 1998, the 3D engines available were still in their early stages. We had engines that were enormous system hogs for the time (that hasn't really changed remind me to go and buy some RAM later) but still had a lot of limits in retrospect. This was a necessary step on the road to the high 3D standards and expectations that we enjoy today, and it resulted in some brilliant and cutting edge games such as Quake, Half-Life, and Unreal, but the competition was fierce, the lifecycles were short, and anyone who didn't struggle constantly found themselves quickly left behind. We produced MDK2 during that era, and it was an enormous amount of work. The Infinity Engine neatly bypassed this struggle and significantly increased the lifetime of the engine by tying the primary type of art in the game (the adventure areas) into 2D paintings rather than 3D models. A painting looks good or bad depending on its quality and age has nothing to do with it. Lastly, our system requirements were relatively low, and we remained available to people who couldn't afford a cutting-edge machine. As to why developers are straying away from the party-based isometric style (as BioWare itself did, starting with Neverwinter Nights), I don't think that there is anything wrong with the approach. There are a lot of real-time strategy games that show us how valid the control scheme and view still are. I think it is simply a matter of the fans and developers wanting to see what we could do with the genre in the new worlds that 3D opened up to us. This ongoing experiment has resulted in Neverwinter Nights, Knights of the Old Republic, and Jade Empire for BioWare, and there are a lot more games to come. GB: Hypothetically speaking, if BioWare was asked to develop another Baldur's Gate title, where would you personally like to take the franchise? Kevin: This question isn't really that hypothetical. Right now we're working on a fantasy RPG called Dragon Age, a game that is essentially the spiritual successor to the Baldur's Gate franchise. Dragon Age incorporates most of the game-play and features from the old Infinity Engine games along with many new ones. Some of the new features include a separate multiplayer campaign, an exploration mode and '˜origin stories'. There are also some new features that we can't talk about just yet : ). Thanks James and Kevin! Here's to another five years of exploring the world of Baldur's Gate!